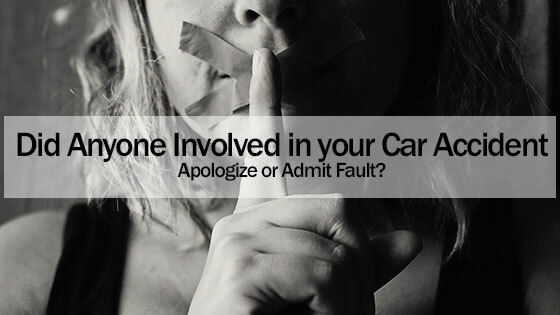 Did Anyone Involved in your Car Accident Apologize or Admit Fault? Home » Blog » Did Anyone Involved in your Car Accident Apologize or Admit Fault? A Car Accident Attorney Explains How That May Affect Your Case. Did Anyone Involved in your Car Accident Apologize or Admit Fault? A Car Accident Attorney Explains How That May Affect Your Case. A car accident can result in serious injuries that you may never recover from. It is also possible that other drivers or passengers could be hurt as well. If anyone involved in the crash apologizes, it could have a significant impact in your case. Let’s take a look at how an apology may play a role in how the matter is resolved, but also the importance of retaining the services of an experienced car accident lawyer. By saying that you’re sorry for your actions, it could imply that you were negligent in allowing the car accident to take place. The same is true of anyone else who says that they are sorry. However, your car accident attorney may be able to downplay any potential admission of guilt during settlement talks or during a trial. They also can use an apology against the other party. It is also important to realize that simply showing contrition toward the other party doesn’t mean that you or anyone else did anything wrong. The evidence will still need to show that you or anyone with you were actually at fault for the crash. An experienced car accident attorney can help you in developing a strong case to support your claims. What Was the Context of the Apology? The context and exact phrasing of any apology made to others in a car accident will be considered during settlement talks or during a trial. For instance, if one was offered under duress, it isn’t likely to carry much weight. The same is likely true if you or another person were merely expressing concern for the others involved. Unless you specifically mention being drunk, tired or using a phone prior to an accident, apologizing generally won’t result in a negative outcome on its own. It is important that you don’t apologize or say anything that could potentially incriminate yourself at a crash scene. Instead, call the police and wait for them to arrive. While it may seem awkward to not converse with others at the scene of an accident, it is better than inadvertently admitting guilt. Furthermore, do not attempt to move or render medical aid to those hurt at a crash scene. By calling the police, you have fulfilled your obligation to render aid. When the police arrive, they will take a statement and facilitate the exchanging of vehicle information. To keep yourself or others from talking before the police arrive, try to keep everyone busy by taking pictures of the accident scene. You can also call your parents or friends to let them know that you are alright or that you need a ride. Depending on the condition of your vehicle after an accident, it may be alright to spend time inside of it while waiting for help to arrive. If anyone else in your vehicle admits guilt or says something incriminating, you don’t have to agree with his or her statement. Your car accident attorney may be able to use existing evidence to show that you weren’t at fault for the crash despite what someone else said. If there is evidence that you were negligent, an attorney may be able to put your actions into context. For instance, your failure to stop at a red light was caused by brakes that malfunctioned or because there was black ice on the road. This may convince a jury that you weren’t liable or weren’t solely liable for damages caused in a wreck.